See full size at Kutnicki Bernstein Architects' website. Construction of the second phase of 50 Orchard Street, a handsome new construction development, on the Lower East Side is expected to break ground next month. 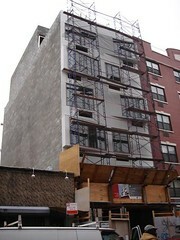 The recently completed first phase consists of 9 condominium apartments in a 8-story building. The second phase will consist of a 10-story addition that will house an additional 25 condominium apartments and it is expected to be completed in about a year-and-a-half, according to Michael Muroff, the architect for the entire project for Voyager Management. The first phase has one- and two-bedroom units ranging in size from about 850 to 1,200 square feet. Some of units in the second phase will be triplex apartments with double-height living rooms, according to Mr. Muroff. The building’s façade is varied in its fenestration pattern and section colors that range from light yellow to beige to pale gray green. The building is not far south from Gus's Pickles and the Lower East Side Tenement Museum at 97 Orchard Street to the north. The building is just to the north of the very attractive, red-brick PS 42 on Hester Street. Orchard Street is the center of the Lower East Side’s “fashion” district, whose most famous store is S. Beckstein Fabrics, which is on Orchard Street north of Delancey Street. Construction has begun on a 19-story mixed-use project at 200 Allen Street on the Lower East Side by The Pomeranc Group, the developer of the Sixty Thompson Hotel, which is well known for its stylish rooftop lounge that is open only to the hotel’s guests. The Pomeranc Group, which is headed by Jason, Michael and Lawrence Pomeranc, also developed the Hollywood Roosevelt Hotel in Los Angeles and the Sagamore in the South Beach section of Miami, Florida, and has plans to open a boutique hotel at 6 Columbus Circle. The Lower East Side tower will include about 70 hotel rooms, about two dozen condo-hotel units and about 10 condominium apartments. It is scheduled to open next year on a site bounded by Allen, Orchard and Houston Streets. At one point, this project was envisioned as being one or two stories taller than THOR (The Hotel On Rivington), the green-glass, 21-story luxury hotel that was developed by Paul Stallings and opened recently nearby and became a major Lower East Side landmark. A Lower East Side skyline is emerging. Construction is advancing on a 16-story tower at 103-105 Norfolk Street that is being developed by On The Level Enterprises Inc., of which John Carson and Angelo Cosentini are the principles, and Hudson Opportunity Fund. Marketing for the units is expected to commence in September. The tower will have 32 condominium apartments and is known as “Blue at 105 Norfolk Street,” a reference to the unusual façade for the project, which has been designed by Bernard Tschumi Architects with SLCE Architects. According to an article at archpaper.com, "the irregular form of this building is due in part to a series of site restrictions: the developers purchased the air rights tot he building next door so that they could build over it, but zoning regulations do not permit the insertion of a column within the neighboring commerical space, so the architects had to cantilever the upper floors out over the adjacent building." A rendering of the building indicates that its upper floors facing Norfolk Street will be angled upwards slight because of setback requirements. Tschumi designed a spectacular small bright red undulating façade within a glass cube for the Museum of African Art for a site on Fifth Avenue at 110th Street but is not longer involved with that project. The Norfolk Street project is due for completion next year. The mid-block development is between Delancey and Rivington Streets and not too far away from the 20-story Hotel on Rivington Street that opened last year as a major new Lower East Side landmark. The Norfolk Street project is separated by a one-story building that houses a nightclub from another striking new condominium project, the “Switch” building at 109 Norfolk Street, a 7-story building now under construction designed by Narchitects where the floors zig-zag and forth with gentle angles creating a lively façade and a new twist on bay windows. It is just to the south of the very pleasant, red-brick Asian Americans for Equality Community Center at 111 Norfolk Street designed by Victor M. Morales, a building that was completed last year. Everyone knows there is a "whole lotta" building going on and that it seems, with only a little bit of exaggeration, that there is construction on almost every street in Manhattan as well as a lot in the other boroughs. If one includes new construction and conversion projects, there are many streets, such as West, Washington, Greenwich and Hudson Streets in TriBeCa and the Far West Village that, in recent years, are awash in interesting developments. The Norfolk Street block between Delancey and Rivington Streets on the Lower East Side, however, takes the cake. It now has three projects underway by different architects and developers that may well make it "the" destination street for lovers of contemporary architecture. The most advanced project is the "Switch" building at 109 Norfolk Street, a 7-story building designed by Narchitects. Its zig-zag façade of angled floors facing Norfolk Street is now nearing completion. The largest of the three new projects is "Blue" at 105 Norfolk Street, now in the early stages of construction. This 16-story building, designed by Bernard Tschumi, has an angled façade of different shades of blue glass. The newest project, which as yet has no "name," is at 115-119 Norfolk Street on the site of a vacant lot and a three-story building that is now being demolished. It has been designed by Grzywinski Pons Architects, the firm that designed THOR (The Hotel on Rivington Street) nearby at 107 Rivington Street, a handsome, green-glass, 20-story mid-block tower that has a "womb-like" entrance, and interiors that are both wild and elegant. The design of 115-119 Norfolk Street calls for a 7-story building with 24 apartments. Architect Matthew Grzywinksi told CityRealty.Com today that the building will "most likely" be a condominium project. He said the developer is Zeyad Aly and that the project is likely to be completed late next year or early 2007. Mr. Grzywinksi said that his firm had been working on the project before it learned about the "Blue" project. "When we saw it, we chuckled," he said, adding that the street’s "concentration" of new projects is "a hot bed for progressive architecture." 115 Norfolk Street will be distinguished by an open-top atrium entrance and by its random design of fretted glass windows. The atrium is slightly off-center to the south of the building’s frontage on Norfolk Street. The atrium will be enclosed in glass on Norfolk Street but its west wall is angled upwards and towards the west and rises a bit above the roofline. The atrium’s top is open to the sky and the angled west wall is somewhat reminiscent of the Austrian Cultural Institute at 11 East 52nd Street designed by Raimund Abraham and opened in 2000. Apartments that overlook the atrium will have the same fretted glass windows as the Norfolk Street façade. Mr. Grzywinksi said that these windows will have random "cloud" shapes in angled fretted designs. This decorative touch is somewhat reminiscent of Lindy Roy’s sinuously-shaped balcony "amoeba-shaped" scrims for a new project now under construction at 519 West 23rd Street known as Highline 519. These projects herald an important new phase in the city of architectural ornamentation that makes a return to decorative motifs, albeit often high-tech and modernistic. The 16-story, 32-unit "Blue" building, which will be one of the tallest on the Lower East Side, is expected to be completed in the fall of 2006. It is separated by a one-story building that houses a nightclub from the "Switch" building at 109 Norfolk Street, a 7-story building now under construction. The "Switch" building is just to the south of the very pleasant, red-brick Asian Americans for Equality Community Center at 111 Norfolk Street designed by Victor M. Morales, a building that was completed last year. Construction is about to begin on Meltzer/Mandl Architects' own vision of the Lower East Side's future. A Kentucky Fried Chicken will be renovated into a seven-story residential condominium with ground floor retail space at 108 Delancey Street. The glass and metal architectural transformation that is reshaping the neighborhood from bohemian tenements to a sleek, high-end future has engaged another location. Last edited by Derek2k3; January 18th, 2006 at 08:56 AM. I am just starting my search to purchase an apartment in NYC. I have been reviewing posts here. Excellent site! In 2004 Derek2k3 states it is a shame people aren't more educated about architecture before they buy. Where is a good place to begin that education? Derek2k3 would be the man to ask. PM him. Is this ^^ the narrow site on the north side of Houston at Ave. B? Yeah. 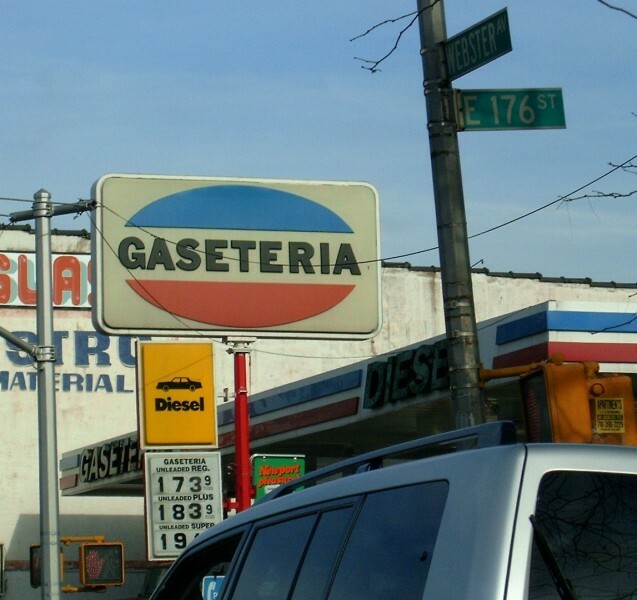 The old Gasiteria site. Yeah, when they were demo-ing the one on Ave. B the old sign was just sitting on the curb with all the other debris. I wanted to ask for it but couldn't get up the nerve. Too bad, that thing would've looked awesome on my wall!